This week’s five AHAs are from the AHAbook™ Being a Catalyst for Success. Please share this URL “aha.pub/SuccessCatalyst” in your social media status update to let your friends know about it. The Kindle version of this amazing book can be downloaded for FREE today, December 19th (Wed) until December 23rd (Sun). Don’t miss the opportunity to pick up this great content: https://amzn.to/2EAJ6nN. 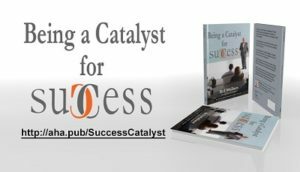 Being a catalyst for success is no easy feat. However, with the right mindset and a heart in the right place, you can become a catalyst for success without you and others even noticing. So how does one become an inspiration for others to become successful? It’s simple – be a good person and live a good life. So how does one become an inspiration for others to become successful? It’s simple – be a good person and live a good life. A good life is not defined by how much money you make. Rather, it’s defined by how you feel when you wake up in the morning and when you go to sleep at night. Start living a good life today! 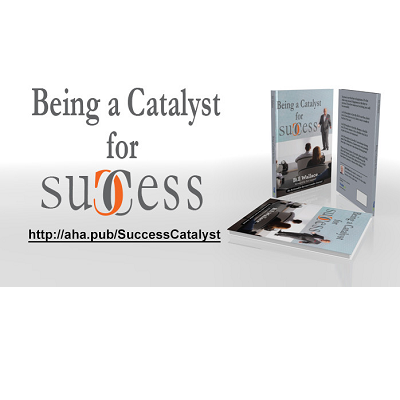 Being a Catalyst for Success is part of the THiNKaha series, whose slim and handy books contain 140 well-thought-out AHA messages. Increase your online influence by picking up AHAthat, and easily share quotes from this book on Twitter, Facebook, LinkedIn, and Google+ via this link: http://aha.pub/SuccessCatalyst. To see and learn how to automatically share AHAmessages from this book, you may check out this video: https://youtu.be/Oyu6XRDpu9w. To know how to automatically share via AHAblaster, please watch: https://youtu.be/XbungDgxUe8.